The excavations near the village of Turan, which ended Friday after 18 months, have unearthed one of the biggest ancient cemeteries in Albania, with about 1,000 layered burials, several of them richly furnished. See photos. TURAN, Albania (AP) — In a rich agricultural basin near the town of Korca in southeastern Albania, gas pipeline construction work is offering archaeologists a unique insight into 5,000 years of history in a country that was off most experts’ radar during decades of isolationist Communist rule. The excavations near the village of Turan, which ended Friday after 18 months, have unearthed one of the biggest ancient cemeteries in Albania, with about 1,000 layered burials, several of them richly furnished. And under the bottom layer are traces of a rare Neolithic settlement demarcated by holes in the ground that supported the now-rotted wooden skeletons of small huts. More than 20 Neolithic sites have been found in Albania, dating roughly from the 7th to the 3rd millennia B.C., which are some of the earliest farming settlements in Europe. But according to Turan lead archaeologist Iris Pojani, the pipeline work provided the opportunity — and the funding — to excavate an unusually large inhabited area from that era. It was “the cherry on the cake,” Pojani, a professor at Tirana University’s faculty of history and letters, told The Associated Press. 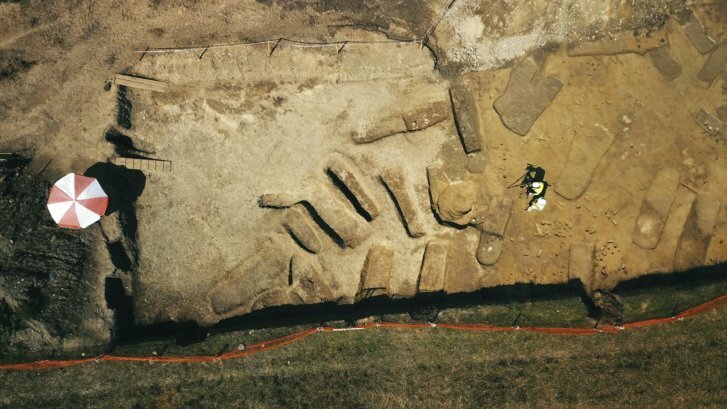 Above the millennia-old huts, her team of 50 archaeologists excavating an area of 4,000 square meters (43,000 square feet) found three cemeteries from the Iron Age, late Roman times and the Middle Ages. No traces of the settlements these cemeteries served have yet been located, but Pojani said it’s easy to see why people through the ages chose to live there. “Even nowadays this is a prosperous agricultural area,” she said. Grave goods included rings, bracelets, earrings, amber and glass beads, gold coins, lots of pottery — including local copies of 11th or 10th century B.C. wine jugs popular in neighboring Greece — mediaeval wooden caskets and clothes worked with silver thread, as well as spears, daggers, knives and swords. Turan, 180 kilometers (110 miles) southeast of the capital Tirana, is the most important of about 30 sites already found during laying of the underground Trans Adriatic Pipeline, or TAP, that will bring natural gas from Azerbaijan through Turkey, Greece and Albania, and across the Adriatic Sea to southern Italy. In Albania, it crosses 215 kilometers (133 miles), but officials say digging is almost complete and no more archaeological finds are expected. “We will leave something that is not just a momentary passage of gas but cultural heritage that people will pass on,” TAP Cultural Heritage Monitor official Arber Kadia said.